SAB World of Beer’s monthly food and beer pairing lunch dates are here for the remainder of 2018. 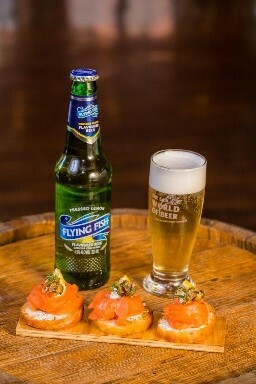 The beer-pairing lunches are held once a month on a Saturday at the five-star tourist attraction in Newtown. “We change the menu every month and guests have become accustomed to a five-course meal that is carefully crafted to pair with SAB brands,” said Felicia Mokoena, general manager at SAB World of Beer. SAB Trade Brewer, Anton Erasmus, guides guests through the pairing – drawing attention to the mouthfeel, flavour and aroma of each beer and how it enhances the flavours and textures of the food. “Beer has many different characteristics thanks to its varied ingredients, with hundreds of malted barley varieties, yeast strains and hops, which make it pair beautifully with food – from sweet desserts to hot spicy dishes, depending on the beer style,” said Erasmus. Each pairing includes six SAB beers and a five-course meal. Ostrich carpaccio, topped with balsamic caramelised onions, parmesan shavings, served with garlic and herb bruschetta drizzled with a lime infused olive oil. Paired with Castle Lite. Boerewors corn dogs served with tomato breedie. Paired with Hansa. A cold calamari and cucumber salad topped with sesame seeds. Paired with Corona. Butter chicken served with sambals and poppadum’s. Paired with Carling Black Label. Decadent chocolate brownie with an espresso anglaise and vanilla ice cream. Paired with Chocolate Milk Stout. Last bookings accepted at 12h00 the Friday before, for catering purposes.